The question forms the title of the artist’s 1977 work on display at the National Museum of Modern and Contemporary Art’s Gwacheon branch as part of the exhibition “Awakenings: Art in Society in Asia 1960s-1990s.” The work was a political statement against former Indonesian President Suharto’s military junta, consisting of a pile of handmade pistol crackers and a desk with a stack of answer sheets to the question. “At that time, I saw a person who was carrying a pistol cracker on the back of his bicycle. I told him that I wanted to buy those pistol crackers. That was in 1977. I bought the pistol crackers and just poured them on a gallery floor. A lot of people then linked my work with militarism, the regime,” Harsono recalled during an interview at the MMCA Gwacheon on Jan. 30. “When I was a high school senior, I was already participating in organizations in school and everywhere. I was interested in organizations involved with politics. 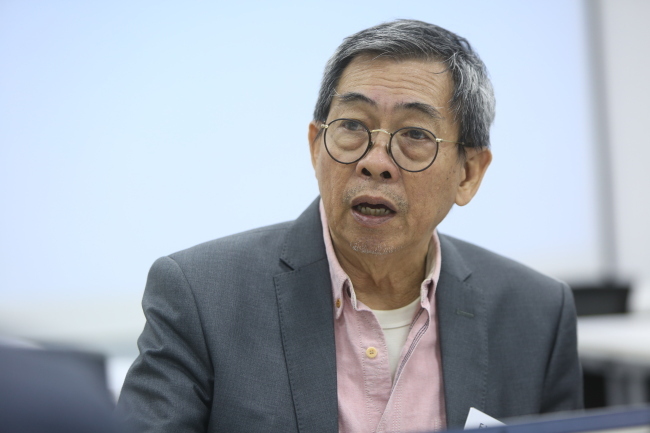 At that time I realized that I did not agree with the political situation in Indonesia -- mostly about the strong military regime that brought suppression upon the people,” Harsono said. “My art has to make good for other people and be something that can make changes,” the artist went on to say, adding that he believes the accumulation of people’s efforts can bring about changes. Harsano’s artworks shed light on the historical and social context of that period in Indonesia. Suharto was a military leader and president of the Southeast Asian nation for more than three decades. Bringing works of site-specific historical context to an international show like the MMCA’s is meaningful because it allows artworks to be viewed in a much broader scope, Harsono says. Exhibitions bringing Asian artists together are also a powerful means to counter the global art scene dominated by the West, according to Harsono. “If Western curators or institutions want to see Southeast Asian arts, they always use their own criteria. They want to see Indonesia from their side,” he said, pointing out that Indonesia is frequently viewed just as an exotic country. “They still have a mindset that artists from Southeast Asia are not important in the contemporary art scene,” he added. Many things have changed in Indonesia since 1998 with the collapse of the Suharto regime, the artist observed. For instance, there is more freedom of speech, and people can now criticize the government more openly. “People’s interests have also changed,” he said. “I would shoot the guy who cheated with my girlfriend” was among recent answers to his work “What Would You Do if These Crackers Were Real Pistols?” according to the artist. Such responses are an indication that times have changed -- and so have Harsono’s interests. “I started to talk about myself, my identity as a Chinese-Indonesian -- an identity that has long been discriminated against,” he said.